Last years, Russian software developers are very famous all over the world. They are talented specialists, they can think outside the box, be creative, purposeful and be able to work in a team. In the Universities typically there are special departments, which specialize ONLY in solving abstract Olympiad problems. Studying there is free, but in order to get in, you need to win a contest. Only 1 in 500–1000 students is accepted and from eligible specialties only (math and computer science). No wonder, that they win such contests repeatedly. It is not a secret that many international programming contests are dominated by developers from Russia. 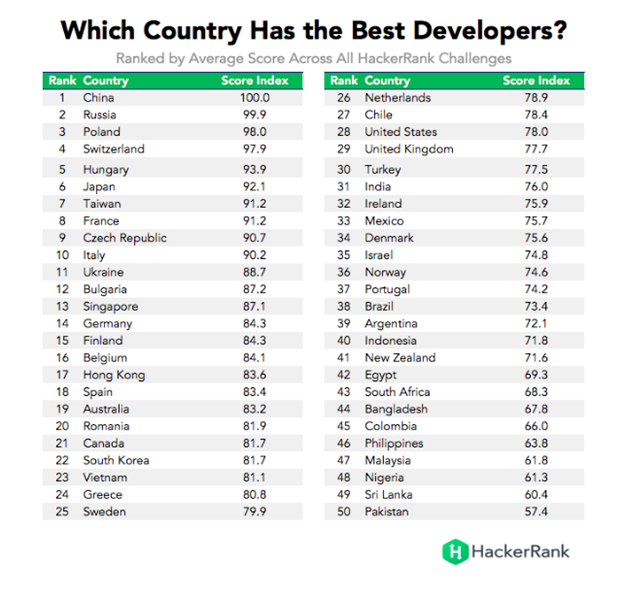 Google Code Jam, Microsoft Imagine Cup, the Central European Programming Contest(CEPC), Top Coder — Russian Developers steadily get the highest ranks in these prestigious events. They are currently ranked 1st in the world in the Top Coder ranking and 2nd at Hacker Rank. And that is exactly true! With strong educational background, one of the highest development skills in the world, good command of English language, caring about good communication, with high security standards and relatively low price, Russian agile design and software development teams seem to be one of the best variant to entrust your software and design development tasks to. While Agile thinking goes around the world, Russian software developers are those who clearly understand the benefits of Agile approaches to solve any level complex tasks. Most of the developers consolidate in the small cross functional teams which strictly follow the principles of Scrum in their work, share Scrum values. They are purposeful, talented, educated people who can think and act originally, going beyond the usual patterns. They are well-known workaholics and you will not find boring people who “serve” their time in the workplace among them. Ideas are discussed, tested and implemented with stunning enthusiasm and speed. Meetings, which may take several hours to complete at other enterprises, are transformed into a thematic discussion at lunch. And only a few walls separate those who create the source code from those who write checks. Such an environment of open communication contributes to the growth of productivity and friendly relations. At on often speak: give necessary tools to people who love to create, and you will see that they are capable of a lot of things. Of course, nowadays the decision to hire the agile design and software development team from Russia may seem some kind of madness because of US mass media hysteria about Russian hackers’ intervention in the US president and Congress election. Mass media form the atmosphere of horror and fear in relation to Russia. They sow the seeds of distrust and phobia in public opinion. It seems that starting to cooperate you will get big problems from powerful government and public institutes. To tell the truth many usual things are different. Another language, different time zone, another currency and living environment. In addition, “sensational” election intervention. But, the judicious point of view is that the most important things are a well-done code, mandatory, reliability and competitive price. Now, you may hire high class specialists for even lower price than in USA due to USD/RUB rate. Russian software developers have all main features mentioned above. Thus, to hire the agile design and software development team from Russia can be the best investment for you now. How to collect requirements for the IT project correctly?